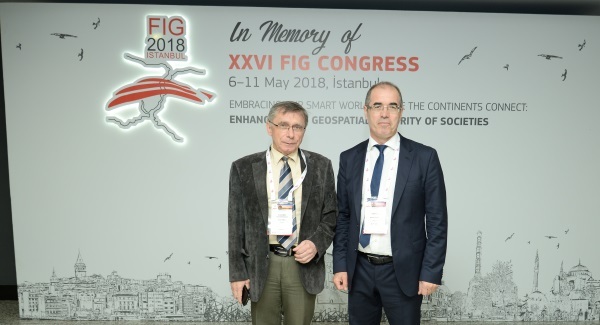 The large 4-year FIG Congress took place in the beautiful city of Istanbul. The Congress marks the end of the term of leadership and the in total 6 days were packed with the General Assembly, technical sessions, meetings and many other activities. 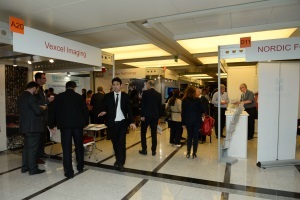 The congress attracted more than 2300 participants, coming from around 90 countries from all over the world. 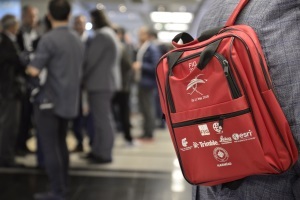 The Turkish representation was remarkable, and FIG was pleased with the large support from both national and international sponsors, organisations and individuals. 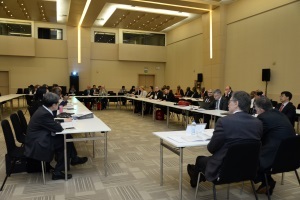 The Reference Frames in Practice seminar was held over two days. The main focus was on reference frames in general, kinematics and dynamic datums which reflects geodetic priorities for all regions suffering from natural disasters such as earthquakes. Most of the participants came from countries where there is a strong need to model deformation to maintain their accurate spatial reference frames. BIM for Surveyors Workshop was also held over two days and with great success. The around 50 participants spent the first day with sessions on BIM and a special tour was organised for the second day to Istanbul New Airport. This tour was a real special experience for the participants. Young Surveyors Conference also attracted many participants who spent the first day in a great and inspiring learning environment. The second day offered a treasure hun around Istanbul and a discussion on the future of the FIG Young Surveyors Network. This year, the Young Surveyors had organsied a Charity Dance. 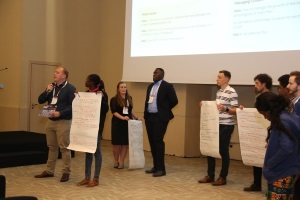 This took place at the end of the seond day of the Young Surveyors Conference - and was held at a time so that other congress participants, incl. all those who attended the General Assembly could also participate. While in Turkey - learn to dance Turkish..., and many took up this challenge and had a fun and great time learning the “Horon” which is a Regional Folk Dance which is a very moving and swift dance style. Horon symbolizes the waves of the sea, the pouring of the rain and the struggle against nature. The donations from the participants of the charity dance went to the local Humanitarian OpenStreetMap Team Local Community “Yer Çizenler Herkes İçin Haritacılık Derneği" and FIG Foundation. 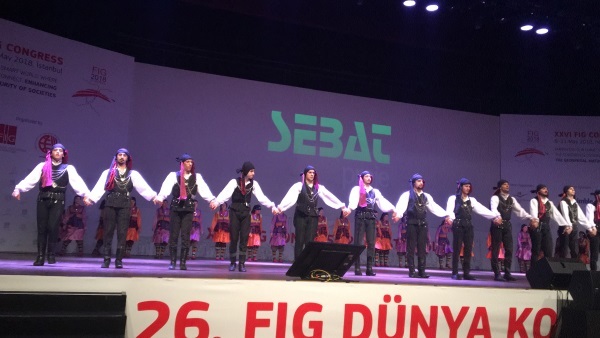 The grand opening ceremony took place in the large auditorium of Istanbul Congress Centre, and the audience experienced a very talented teenage dance company from Ankara. A beautiful start of the Congress. 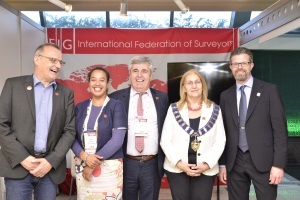 After the national anthym and the traditional FIG Fanfare an impressive video was presented showing the multitude and magnitude of what surveyors are doing. 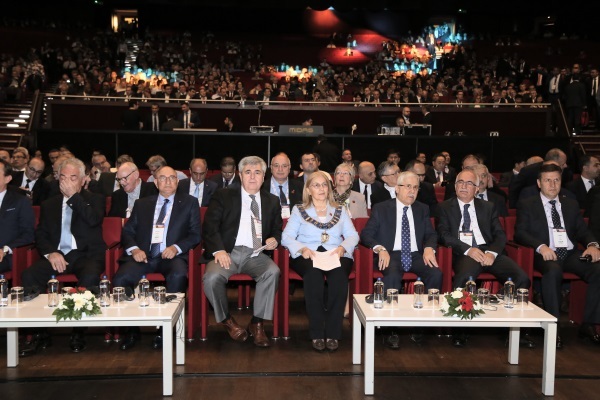 After this spectacular start of the Congress Mr Orhan Kasap President of the host association, the Chamber of Surveying and Cadastre Engineers of Turkey greeted the more than 2300 participants who have found their way to Istanbul and to the Congress. Mr Ertuğrul Candaş who has been President of the Chamber since the General Assembly in 2014 elected Istanbul, Turkey as destination for the FIG Congress 2018, welcomed everyone to Turkey in a well-formulated English. Finally, Dr Orhan Ercan, Co-Congress Director for the FIG Congress 2018 went to the stage - happy to see all the many attendees after four years of preparations. FIG President Chryssy Potsiou held her welcome address and thanked the local organisers for their hard work on the preparations during these four years. Four years is a long time - but they go fast when such a big event is being prepared. President Potsiou also had a special greeting to those who attended for the first time and encouraged them to participate in FIG. 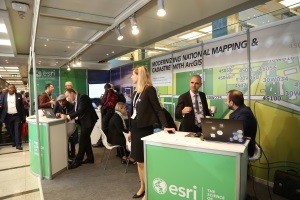 enhancing the geospatial maturity of societies is of importance both for Turkey and also Internationally. At the end of the Opening Ceremony the exhibition, that was found in the large hallways, was opened, and the honoraries walked apst the many international and national stands. The first plenary session with the overall theme Urban Development was chaired by Ms Oylum Talu, a popular Turkish television presenter. She guided the three plenary speakers through an inspiring plenary session with questions and comments. First speaker was FIG President Chryssy Potsiou. Since it is her last year in the chair she gave a summary of the FIG achievements during her term 2015-18. Dr. Mustafa Palancıoğlu, Mayor of Talas, Kayseri was the second speaker of this session (replacing Mr. Mehmet Özhasekí, Minister, Ministry of Environment and Urbanization who was unfortunately not able to attend due to the upcoming elections in Turkey) talked abou the Urban Regeneration Process in Turkey. He said that due to the fact that cities in Turkey are cituated in an earthquake zone there is a need to build safer. In the latest 75 years more than 60,000 lives have been lost due to earthquakes. This means that around 350,000 houses need to be reconstructed due to the new law of regeneration which causes extremely high costs. A 6 step implementation plan is used which also gives room to plan more social urban welfare and public areas. Prof. Ali Parsa, Dean of the School of Real Estate and Land Management at Royal Agricultural University was the last speaker in the session talking about The Fourth Industrial Revolution and impact on Urban Development: the Role of Real Estate. The number of world population that live in cities has grown immensely since the 1950'ies and this trend is supposed to continue reaching an urban population of 6.4 billion (out of around 9.6 billion) by 2050. He explained the Fourth Industrial revolution and its game-changers and used Singapore as example of a smart city with a long term vision. He made the audience think of the fact that today, the top 6 companies in the world are internet based companies. 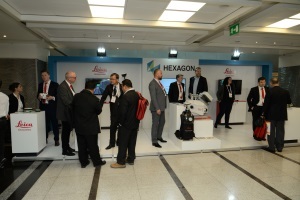 The second plenary session, themed Modern Technology Usage for our Profession was opened by the first speaker Jürgen Dold, President of Hexagon Geosystems. He talked about Transformation through Digitalisation with numerous lively examples of what to expect for the future at a digital level especially in connection with smart cities and the smart use of smart data. Chair of FIG Commission 10 Dr SeeLian Ong took over and talked about the new standard on construction ICMS and the need for global consistency in measurement and in the reporting of construction cost. A global standard is important in order to be able to benchmark construction costs consistently and transparently. If it is possible to talk the same construction-language all over the world it will be much easier to cooperate. It was also important for the involved that the standards should be simple (incl the language used) so that the standards will be geninely understandable and usable. The work on the standards was started in 2009 by six organisation, ICEC, PAQS, AAQS, CEEC, FIG and RICS and was launched in 2017. The 2nd edition will be launched in 2019. The third and final speaker was Prof. Charles K. Toth on Smart Cities - the mobility component. He talked about the possibilities in positioning and navigating for the infrastructure and traffic. There has been a remarkable development in the driverless cars/transportation and the technology behind, the use of big data to create smart scities, and what smart mobility means to smart cities. The third plenary session offered three presentations on Rural Development, starting with Dr Michael Klaus, Director of the Hanns Seidel Foundation (HSS) who talked on Rural development for achieving the Sustainable Development Goals: Fostering the Rural-Urban interrelationship. 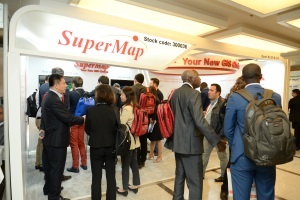 The previous two plenary sessions had a focus on urban development - which has a big focus these days. The rural development, though, is also of big importance and growth in agriculture and rural sector of developing countries has a much greater impact in reducing poverty and hunger than do urban and industrial growth. The rural development is inevitable for attaining the UN Sustainable Development Goals (SDGs). Dr Klaus elaborated over a new rural development paradigm and the rural-urban relationship. Mr. Jawad Peikar who is Chief Executive Officer Afghanistan Independent Land Authority, ARAZI, GIRoA was second speaker in the session and talked about the Afghanistan Institutional Development Program for Land Administration - Learning from Best Practices: Towards a Sustainable Land Administration System in Afghanistan. Afghan Land Authority has in cooperation with the World Bank and government of Turkey worked on modernizing its land administration that will lead to a modern infrastructure for the land administration. By learning from the Turkish experience it has been possible not to do pilots but to work on the learnings from a tested land administration system. This development was further elaborated upon at two special World Bank/FIG sessions. Prof. Dr. Mehmet Babaoğlu, Member of Parliament Parliamentary Commissioner for Agriculture, Forestry and Rural Affairs should have been the third plenary speaker, but he had to cancel in the last minute due to the upcoming elections, and when asked Mr Brent Jones, ESRI, took up this challenge and managed to prepare a plenary presentation within very short notice. A big thank you to Brent Jones who gave an interesting talk about the Changing Landscape of Land Administration. He posed the provoking question on how much can a robot take over the work of different kinds of surveyors... A lot of information is already taken over by computers, programmes, satelites etc and darge data samples can be handled in real-time whereas previously data that was created was already out of date when released. So, Brent Jones finalised his presentation with another question: How do we stay relevant? and presented "Brents seven rules for success"; think big and spatial; use your tools; stay current; create new services; be free or affordable; move quickly and evolve and finally get started now! The fourth plenay that took place on the last conference day had Spatially enabled societies as overall theme. FIrst speaker was Keith Bell, World Bank talking about Fundamental Infrastructure for Spatially Enabled Societies. He started his presentation by noting that 2018 marks the 20 year anniversary for the FIG publication Cadastre 2014 written by the chair of the session and FIG Honorary Member, Daniel Steudler, and translated into 28 languages (this publication has been followed up by the publication Cadastre 2014 and beyond). The projected trends and vision of what cadastral systems might be in 20 years time have proven true. Hereafter he talked about the globel land and geospatial agenda and possibilities within the sustainable development goals and the World Bank approach. Challenges for the land agency governance are that substantial financing is needed and that it is a monopoly commodity vulnerable to corruption. A reliable cadastre is essential for property valuation and as base for taxation. Prof. Abbas Rajabifard, UN-GGIM Academic Network took over with a presentation on Spatially Enabled Societies and Smart Communities. He pointed out that in order to get an interconnected future for all there is a need for multidimensional land info and a smart cadastre system stating that "Future is smart, connected and sustainable". The final speaker was Dr. Victor Khoo, Senior Deputy Director Singapore Land Authority (SLA) whose presentation marked a end of the congress and was further to this aa great wrap up of the presentations from the previous days with his presentation on how Singapore has worked towards a spatially enabled smart nation. Several of the previous plenary speakers had used Singapore as example and now the participants got an insight from closest hand in how this development because such a success story and how it has worked towards a smart, sustainable and resilient city of the future. There are links to recordings of all plenary presentations in the proceedings. The rest of the four session days were filled up with sessions that were specially designed and sessions with presentations from the open call for papers. Hereto there were a large number of workshops, meetings and sessions with parners like UN-Habitat/GLTN, World Bank, UN-GGIM and FAO. It is impossible to cover all areas, so have a look into the proceedings. A recond number of member associations attended the General Assembly that took place 6 and 11 May. On 11 May 73 out of 105 member associations were present representing in total 91 votes. The first General Assembly was a day of presentations by the President on the 4-year achievements, the commissions, networks, permanent institutions and task forces. The last part of the day was used for the nominees to present themselves preparing for the votings that took place on 11 May. On 11 May the traditional Presidents meeting was held and hereafter the the votings that all were awaiting took place. Istanbul Congress Centre was the venue of the Congress. The large hallways were used for the exhibition which meant that session rooms and exhibition could all be on the same floor creating a dense and lively traffic in the hallways. 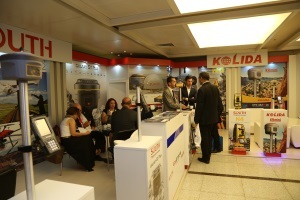 More than 50 exhibitors showcased their latest news and products at their stands and some also took the opportunity to make presentations at the stage in the exhibition area. 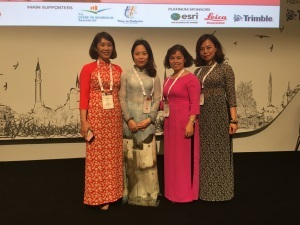 Three of the four FIG Platinum Corporate members, Esri, Leica and Trimble who were also platinum sponsors at the congress, were offered a special session in the technical programme which were all well visited. 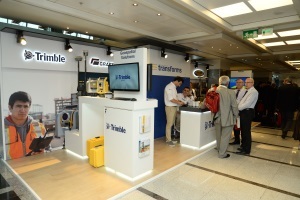 A huge thanks to Esri, Leica and Trimble for their faithful contributions to the FIG Conferences. A large thanks also to the two main supporters The General Directorate of Land Registry and Cadastre and T.C. Cevre V Sehircilik Bakanligi as well as the Gold Sponsors Harmaid and Beylikdützü Municipality, the Bronze Sponsor Sebai/Delair nd Basic Sponsor Hi-target. A substantial part of the congress is of course the technical programme where it is possible to gain new knowledge and get inspired. Attending a FIG Conference is however a lot more. Networking is an important part - this is where it is possibe to really discuss the learnings, find people to ask and learn from, and to get contacts that can last far beyond the conference. A conference is certainly also about contacts and networking. The networking experience starts at the Newcomers session which again this year was held right before the Opening Ceremony. Evaluations from previous FIG Congresses and Working Weeks have shown that around 1/3 or the participants are attending for the first time. The Newcomers Session is a way to get acquainted with FIG and also with other fellow-newcomers. Coffee breaks and lunches are other places to meet and exchange as well as the Welcome Reception. Further to this it was possible to attend a Traditional Turkish Evening (FIG Foundation dinner, sponsored by Trimble), a spectacular dinner with music and a possibility for all to join in the dance, and the Gala Dinner that took place on a boat sailing on Bosporous. It was very spectacular to sail up and down the beautiful coastline which gave an extra dimension to the networking with many of the participants. The technical sessions were a mixture of the more traditional presentations, engagement, groupwork and discussions. 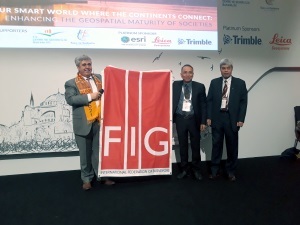 Finally, a large thanks to the local organising committee who for four years, since the Gneral Assembly in 2014 voted Istanbul as destination for the FIG Congrwess 2018, have worked hard and very dedicated to make this FIG Congress a huge success for all participants, sponsors, exhibitiors, accompanying persons and partners. FIG would not be able to carry through a conference without this work from the local member association, and some very dedicated persons. A special thanks to Co-congress Director Orhan Ercan for his tireless and efficient work together with Prof. Muzaffer Kahveci, Mr Muhittin Ipek, Mr Harun Resit Sever and Mr Ertugrul Candas, who was President of HKMO during the 4 years of preparations and also in the bidding process. 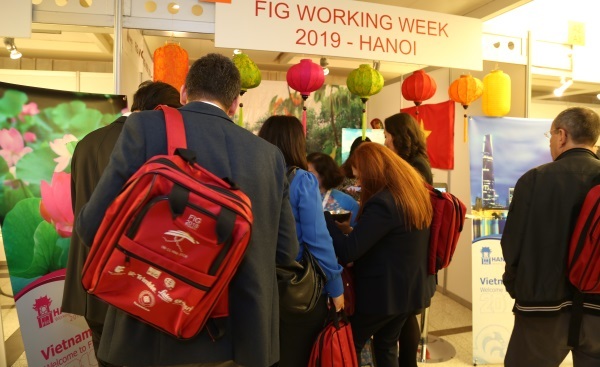 See you in Hanoi, Vietnam 22-26 April 2019 for the FIG Working Week. 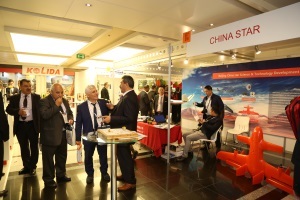 "Good bye Istanbul, Turkey and FIG Congress 2018 and Welcome Hanoi, Vietnam FIG Working Week 2019"